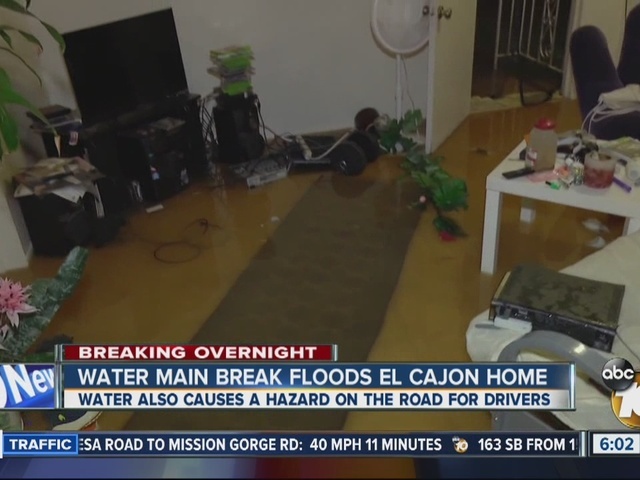 EL CAJON -- A water main break just outside El Cajon early Thursday morning flooded a home and prompted authorities to close a stretch of Greenfield Drive. The ruptured 12-inch water main sent water into Greenfield Drive between Oro and North 2nd streets shortly after 1:30 a.m. Water was sent gushing into a nearby home. The owner told 10News the water was about ankle-high throughout the house, flooding belongings and destroying electronics. "I don't know what to do, I don't know what to think, I just want to get out of here," a woman said. California Highway Patrol said the portion of Greenfield Drive just east of Oro Street was not quite flooded, but could become a larger problem if no repairs are made. The county Department of Public Works responded and closed Greenfield Drive between Oro and North 2nd streets. The closure was expected to last all day, according to the CHP. This could cause issues for businesses in the area. CHP officials advised motorists that Flamingo, Persimmon and Sumner avenues could be used as alternate routes.